Maine Discovery Museum and Maine Robotics partner to bring back the Community Builders Camp program to the Bangor area. 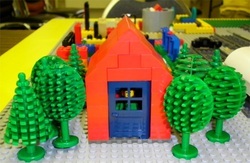 Do you have children 6-8 years old that love to play with LEGO? Well, what if they could be learning real life skills while they played? That's what the Community Builders Camp is all about. Children work in small groups to build houses and bridges and by the end of the week they have built an entire community. Each child also spends a little time (with help if needed) writing in their journal and adding in photos of what they have created. This is a perfect opportunity for children to move forward in their creative nature. Offered this year as a collaboration between Maine Robotics and the Maine Discovery Museum. For a complete list of dates; times; and cost, visit the Maine Discovery Museum's Summer Camp Page.